Thank you, Mr Mira, for showing my point, in your reaction to my article in Awene last week! My point was: do not make up, do not publish rumors, check and recheck, one source is no source. And: please colleagues, don’t do to others what you do not like to be done to you. And look, Mr Mira does exactly that. He makes a journalistic issue into a personal fight. 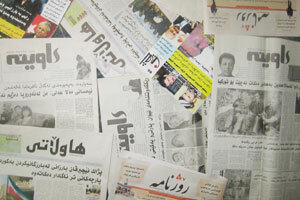 My intention is to help the quality of journalism in Kurdistan forward, so it can survive. Newspapers have lost a lot of readers in the past year. It is high time for a quality impulse. Media should be the mirror of the society. I asked my Kurdish colleagues not to crack it, so but people and journalists get a clear idea of what is happening in the society. Kurdistan is part of the world, if it wants to move forward not only politics should improve, also journalism. So let’s look at what Mr Mira wrote. A main rule in journalism is that when you write about someone, you should check your facts with this person. He/she should have the right to react. Mr Mira did not phone me, or write me, or send me an email, or even a message through Facebook. Where I criticized the way his paper published a story so badly sourced that it became outright slander, he publishes slander about me. You should not publish rumors or slander, it is a clear rule in the codes of ethics published all over the world. Check, recheck, only publish what you know for sure, so your readers know they can trust you. Mr Mira writes about students who come back from Holland with a story that Dutch journalists are in Kurdistan ‘working for authorities and specific leaders’. He suggests foreign journalists choose Kurdistan only to benefit. The students, are they a source? No, because they only repeat a rumor. How do those students know? Who did they speak to? Who was their source and how much can we trust that source? And who were those students, and for that matter, the journalists they mention? And again, even if you agree on the students as a source, this is only one, anonymous source. One source is no source. Mr Mira seems to feel people cannot choose to come to Kurdistan to work and use their knowledge to help others. Is Kurdistan such a bad place? And what financial benefit can one get from teaching, or reporting? Is he suggesting they profit from the oil dollars? In what way then? And in my case: if Mr Mira wants to see the reports of IMCK, which are sent to all our funders, which have been checked by an accountant, which are agreed upon by very strict financial controllers in the West – he is welcome to them. He will see that the organization is funded by foreign embassies, foreign ministries, foreign organizations, and a tiny little bit by Kurdish money. Ah, he will say: there you are. Yes, Nercirvan Barzani was kind enough to help fund the post graduate training in journalism. We have always been very clear and thankful about that. With other funders he made it possible to train young journalists. His funding was no different than that for activities we organized with help of PUK, KDP, the ministry of Culture… And Nercirvan helped, because there were no funds to be found inside the Kurdish government, and he agreed that modern, professional journalism is needed in Iraq. I would have liked to invite Mr Mira on my begging trips to Kurdish and Iraqi authorities. ‘Please help us improve the quality of journalism’. He would have heard the ‘we have no money’ repeated many times. He would have heard the spokesman of Al Maliki offer support, but no money. He would have seen my frustration, and probably felt it himself too. Mr Mira, I would like to ask you: what is independence for you? For me it is, and I am sure I speak for most people in the West, not being tied to anyone or anything. In practical sense that means I work for everybody. We train party and independent journalists, we train all politicians and all police, I publish in my own Dutch newspaper and in Awene, Rudaw, Kurdistani Nw, Aso… (the last article was published in three of them, not only in the KDP shadow Rudaw as Mr Mira seems to think – does he not read Awene?). It also means IMCK gets money from many different places. And I wished more would be found locally. Since the NGO Law took a long time to go through parliament, it has been impossible to find Kurdish funding for NGO’s. We are working for the Kurds, so it would be logically to have more Kurdish money for our activities. As for myself, it seems Mr Mira has not done the basic research needed. Did he wonder why I still work for my Dutch newspaper, next to a six day job? Partly because I need the income. Did he see my Monica? Well, I do not have one. Not only because I do not like this car, but mainly because I cannot afford a car on my local salary with rents as high as they are in Kurdistan. Did I benefit? Sure. I found some great friends here. Mr Mira mentions Ari Harsin – we are both from Holland – but he could add Asos Hardi, Shwan Muhammed, Parwa Ali, Khidher Domle, Dlzar Arif, Yahya Barzinji, Ahmed Mufti, Kawa Mahmoud and many others to the list. What do they have in common? They are Kurdish and open minded. They have different party backgrounds, but those backgrounds are not the reasons for my friendships with them. Now why did Mr Mira not check his information with me? Or check me out on the internet – on the IMCK website, my own site, on Facebook? Or if he could not read the English, ask IMCK’s board members about me? Or ask for our year reports? I wonder. Perhaps because he knew that he would have no story left? That is a bad habit of journalists all over the world. Do not check the story too much because it might turn out to be untrue, and then you are left with nothing to publish. Bad journalism is everywhere, I am afraid. Let’s try to work on improving it in Kurdistan. Mr Mira mentions that he ‘has evidence and can prove it’ on the story which lead to his reaction. Well, if he has the evidence, why did he not print it? Because that is all my criticism is about: prove what you write. Come up with eye witnesses, with named sources. The charge is too sensitive to be based on ‘a source in an Islamic group’. Often journalists have to be more careful than even judges: if you say someone was planning murder, you have to prove it beyond doubt, otherwise it is slander. One source, and even two are not enough when they are anonymous. If Mira had published the article with a Mr A and a Mr B being quoted, he would have been working in a good way. And the politicians would not have turned on him, but on Mr A and B.
Luckily I have not only seen bad journalism here, though. Soran Mama Hama, whom Mr Mira mentions, made a very good story about the ties between prostitution, politicians and police. Well researched, well sourced. I have used it as an example in workshops. And I must have understood Mr Mira wrongly or something must have gone wrong in printing – Soran did a great job there, on his own, no way he would have let anyone else do the work for him. He was a good journalist, and it was a big loss when he was killed. As most of my colleagues, I am still waiting for the murderer to be tried. Because no way journalists who do their work – and show what is wrong in a society - should be threatened, beaten, jailed or killed. Nowhere. Let us be very clear about that. Not in Kurdistan, nor anywhere else. An strong, and soft-language, article. I am partly also involved in this discussion. I am Ari Mamshae, an so-called journalist from Iraqi Kurdistan, as well as an recent graduate from University of Kurdistan-Hawler. What I am aware of in this context, is Mira's use of the Dutch students' words of an Dutch journalist working for the KRG as an supporting evidence to attack the KRG, the Dutch journalist and Judith herself. Honestly speaking, this Dutch students had an exchange program with our university, and I was leading the program here. In their visit in May 2011 to here, they visited Ahmed Mira in Suleymania (I didn't go with them due to unavailability). When they came back, they told me that Mira had said an Dutch journalist (name held by me) is working as an intelligence agent for the KRG. Thus, it was Mira himself who had said this, and not the Dutch students. The Dutch students only cited him. But he behaved as this statement was said by the students through their observation in Kurdistan. I just wanted to make this point clear, and I completely support Judith Neurink, because this is not the only "secret" story of Mira which I know.